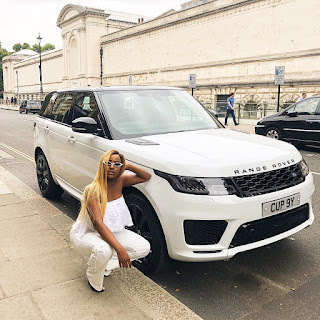 Billionaire daughter DJ Cuppy shows off brand new 2018 Range Rover gift from dad.. Sharing the image of her posing beside her new whip she said..
"Out with the old, in with the new! 🚐💨 THANK YOU @FemiOtedola 🎁♥️ #NewCarAlert #2018Sport #WhiteOnWhite #LevelUp"
Level up indeed! We say congratulations to her!